In my last Map of Biomedicine blog post, I discussed companion diagnostics and the FDA approval process for such tests. In this post, I’ll be talking a little bit about research use only (RUO) tests and use that to segue into a discussion about a kind of test that is going to turn diagnostic testing on its head. The distinction between RUO tests and the clinical tests we’ve been discussing is pretty simple. RUO tests are used only in research studies with consenting participants. The big catch is that the results of the tests won’t be used to change the patient’s treatment. On top of that, the results are often anonymized so that the researcher doesn’t even know who the participants are. For example, I’m sure that when the BRCA1 gene was first discovered, there was a study done to sequence that gene in women with breast cancer, as well as in healthy controls to determine how often BRCA1 mutations were found in those two sets of people. In some cases, there were probably BRCA1 mutations found in the healthy controls. But since this would have been a research study to determine how much BRCA1 mutations increase a woman’s risk of breast cancer, there wouldn’t have been enough information during the study to tell the woman anything about what her results meant. Of course, this type of test later became a commercial product, but that was only after a lot of these kinds of research studies were done to quantify the risk associated with the mutations. I’ve been talking a lot in these posts about BRCA1/BRCA2 tests. These kinds of tests, which look at individual genes, are dinosaurs. They are certainly making diagnostic companies a lot of money now and probably will for a few years to come. Soon, though, today’s BRCA1/BRCA2 tests will be replaced by tests that sequence the entire genome all at once. In the decade since the human genome was sequenced, new technologies have been developed that can sequence an entire human genome for a couple thousand dollars. This means that sometime soon, genome sequencing will be a commonplace diagnostic test. Most striking: those tests will not be anything like the diagnostic tests we use today. Traditional diagnostic tests are run repeatedly so that the results can be tracked over time. For instance, cholesterol is tested regularly as a way to assess risk of heart disease. Colonoscopies and mammograms are done regularly in some populations to screen for evidence of cancer. When a diagnostic test is performed, the results are interpreted to provide useful information to a patient and their physician. A year or two later, the tests are repeated to reassess the patient’s condition and disease risk. Now, however, a person’s DNA can be sequenced for diagnostic purposes. The germline DNA, which is present in all the cells in a person’s body, does not change over time. So there is no need to test it over and over. However, based on clinical need, a person’s germline genome might need to be reviewed periodically. For instance, genetic variants influence how much of a drug is the right dosage for a particular individual, and the risk of side effects that that individual might experience. But that won’t be a new diagnostic test; instead, doctors will simply reference a person’s genome for specific variants that are known to affect drug dosages or side effects. In addition, an individual’s genome contains a huge amount of information that is not yet linked to disease risk or other clinical utility. Scientific research is going on all the time that might discover the meaning of specific regions of the genome. Some of the results of those re-interpretations might be clinically relevant and could lead patients to make lifestyle changes or to have additional testing. This means that the diagnostic use of a person’s genome is much different than traditional diagnostics. You need a way to store the genomic information so it can be consulted as needed, and also re-interpreted as new discoveries are made. Consider what happens today when you get, for instance, a cholesterol test. If your doctor uses an electronic medical record system, which has become more commonplace, he or she might have those results in the record system and be able to look them up as needed. But a cholesterol test might be made up of twenty numbers. On the other hand, a genome sequence is made up of the billions of letters of your genetic code, and those letters can be annotated with complex information like risk for particular diseases, and in some cases, multiple diseases. I added another entity to the Map of Biomedicine, called Manage Genome, to represent the long-term storage of genomic data. I left a question mark where I usually put information about the kind of organization that performs the activity. That’s because it’s unclear who will be doing this. Will it be electronic medical record companies? Will it be more specialized companies? Or perhaps existing diagnostic or instrument companies? I also left a dotted line from Run IVD Diagnostic Tests because there are no FDA-approved whole-genome sequencing tests yet. I did draw a line from Perform LDT Tests because there are companies that will do whole genome sequencing for you in their own labs, and send you the data. But this kind of work is in its infancy, and I’m sure this part of map will change over time. 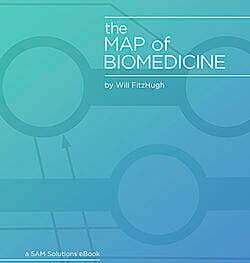 Up next on the Map of Biomedicine: I’ll talk more about the kinds of organizations that develop and run diagnostic tests, including the new genomic tests.